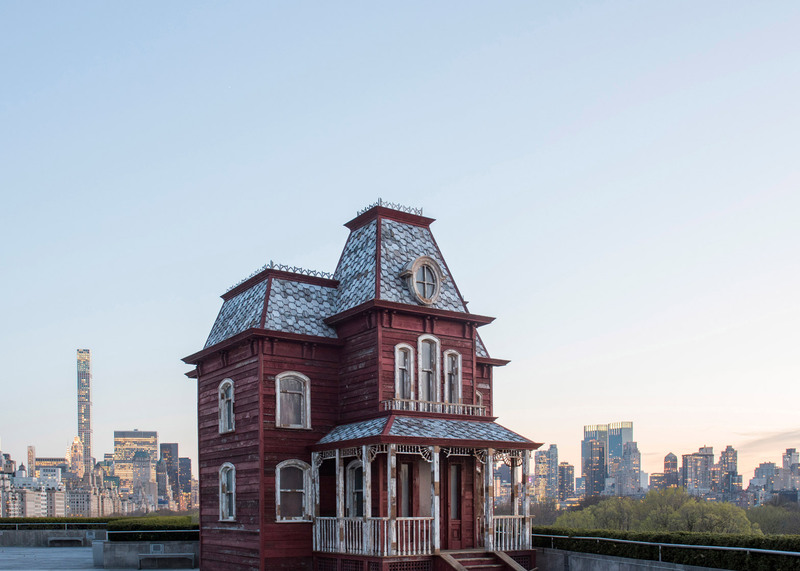 British artist Cornelia Parker has created an installation based on the mansion from Alfred Hitchcock's film Psycho for this year's Roof Garden commission at The Metropolitan Museum of Art in New York (+ slideshow). 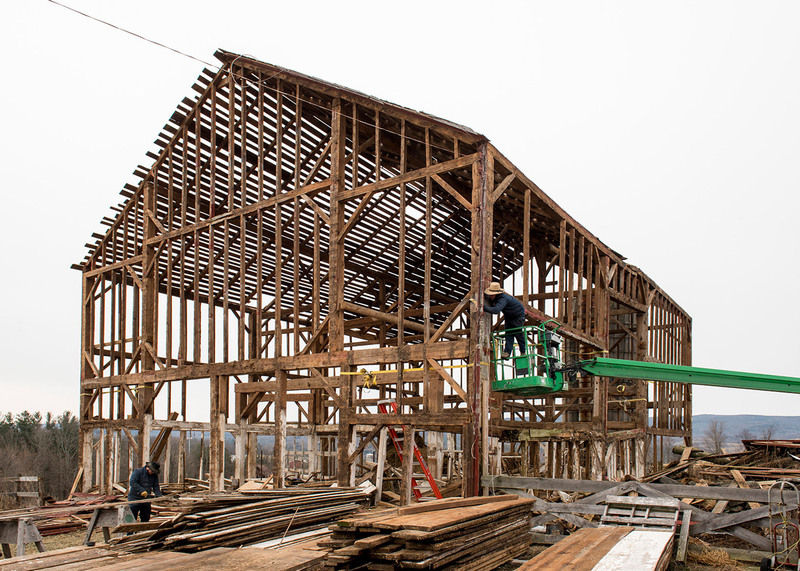 The site-specific Transitional Object (PsychoBarn) initially appears like a real house, but is actually made up of two facades propped up by scaffolding. It is located on top of the Metropolitan Museum of Art, also known as The Met, which sits in New York's Central Park. 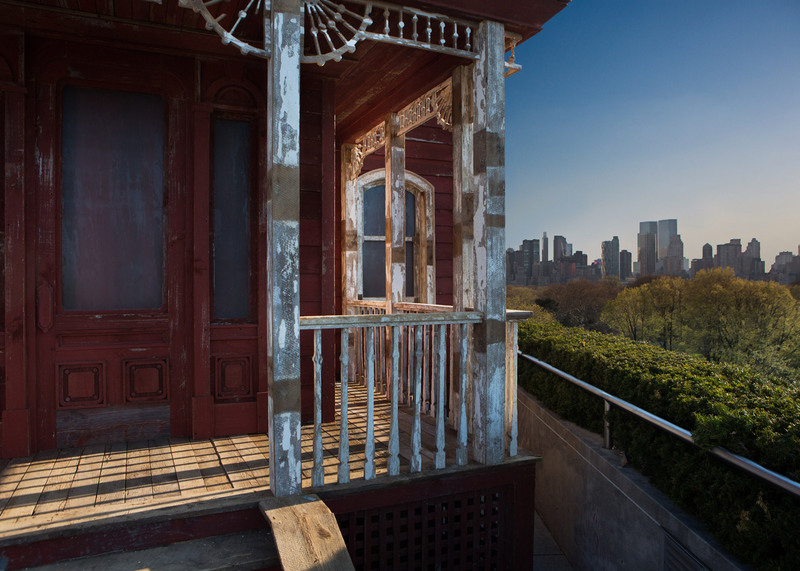 The domestic style of the false dwelling is intended to contrast with the backdrop of Manhattan's soaring skyscrapers. "When I saw the roof and the skyline, I knew I wanted to make something architectural," Parker told Dezeen. "I wanted to add something incongruous to the view." Parker's references for the folly included paintings by US artist Edward Hopper and classic red barns typical of rural America, as well as the sinister mansion from Hitchcock's 1960 thriller. In the film, the house is home to the family of Norman Bates – a psychotic murderer who lived their with his domineering, deceased mother. 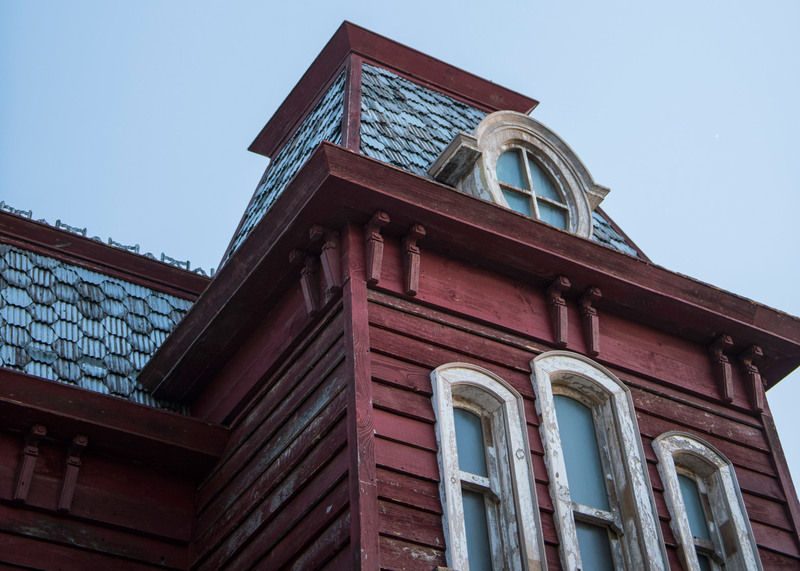 "I read that the Psycho house was based on Hopper's House by the Railroad, so the red barn and the Psycho house became merged," Parker told Dezeen. "The Psycho house was all about evil and emotional baggage, and the barn is the opposite – it's all about wholesomeness." 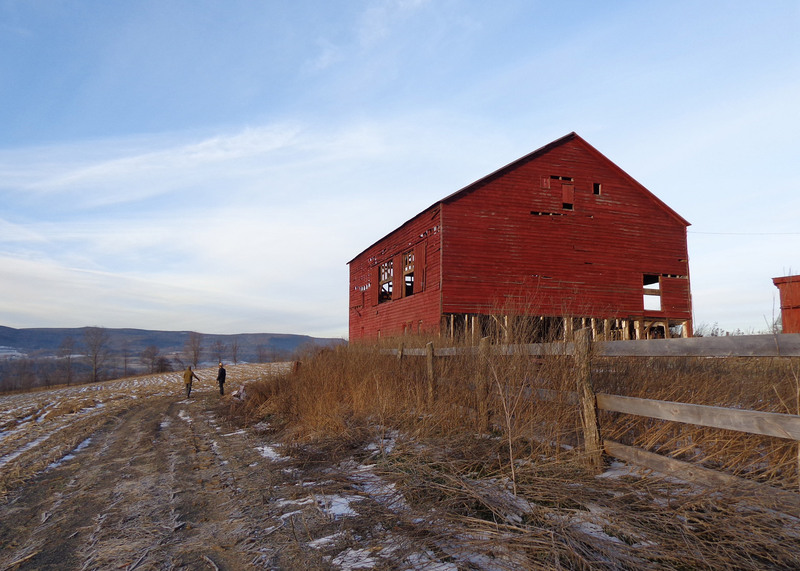 She assembled the 30-foot structure with materials from a dismantled red barn in upstate New York, reusing its wooden slats along with dishevelled window frames and corrugated metal roof tiles. "If you get close to it, you can smell the animals on the wood," said Parker, who often works on large-scale sculptures. The artist collaborated with New York company Showman, which works on stage sets for films and political TV debates, to build the installation. The scaffolding poles and water drums hidden behind enable it to withstand 100 mile-per-hour winds. 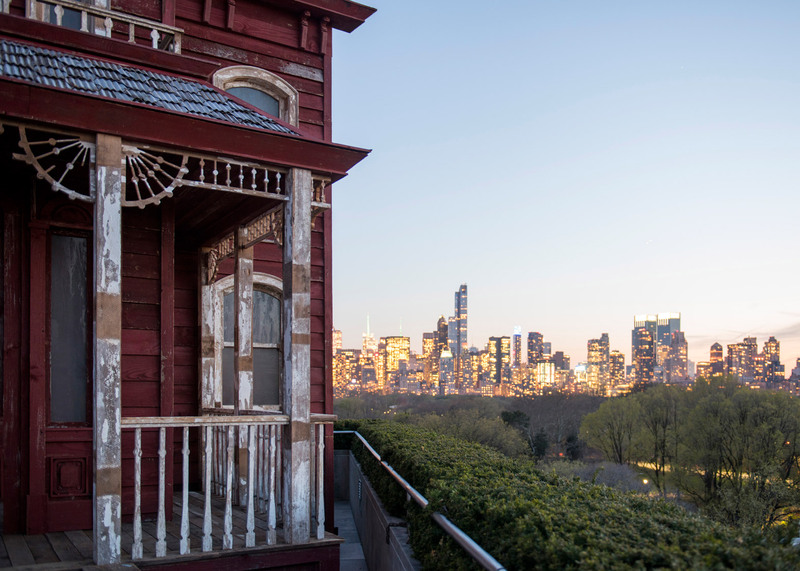 The Roof Garden Commission: Cornelia Parker, Transitional Object (PsychoBarn) was conceived by The Met's chairman of modern and contemporary art, Sheena Wagstaff, and curated by Beatrice Galilee, in collaboration with Parker. 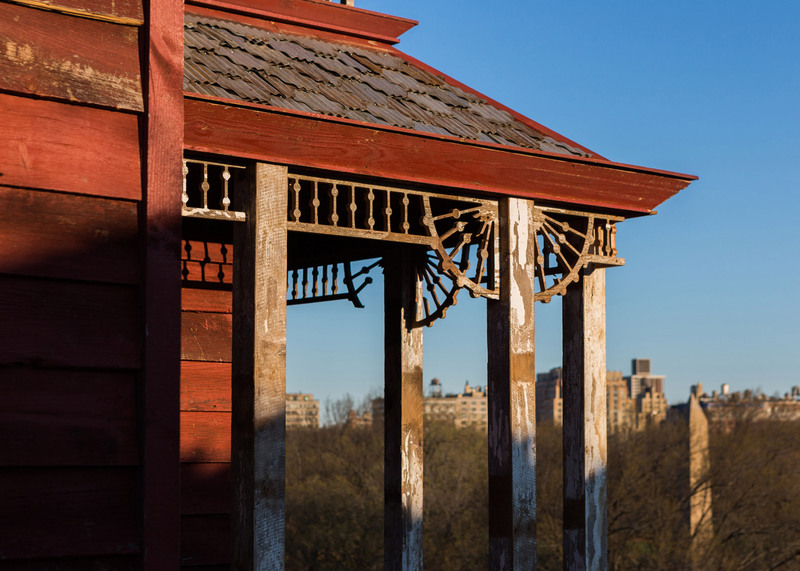 "For this summer's Roof Garden Commission, Cornelia has developed an astonishing architectural folly," said Wagstaff, "that intertwines a Hitchcock-inspired iconic structure with the materiality of the rural vernacular." "Combining a deliciously subversive mix of inferences, ranging from innocent domesticity to horror, from the authenticity of landscape to the artifice of a film set, Cornelia's installation expresses perfectly her ability to transform clichés to beguile both eye and mind," she added. The installation will be on view to the public from 19 April to 31 October 2016. This is the museum's fourth annual commission for the Iris and B Gerald Cantor Roof Garden, following Pierre Huyghe's 2015 piece that comprised patches of dirt and an aquarium with ancient species. The Met's 2016 summer programme also includes the Costume Institute's Manus x Machina exhibition, which will open on 5 May 2016 and explore technology's impact on fashion. Last month, the museum opened The Met Breuer – the renovated Marcel Breuer-designed former home of the Whitney Museum – following the reveal of a controversial new logo earlier this year. The Met Breuer will temporarily house the museum's contemporary and modern art collection while a David Chipperfield-designed extension is added to the main Fifth Avenue building. Photography is by Alex Fradkin, unless otherwise stated.